More than 1.5 million people realize that keeping their data only on the hard drive is not enough. 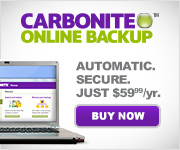 These people decided to backup their data with Carbonite Cloud backup. Carbonite is an online backup platform, which allows Windows and Mac users to store their files, folders, emails, and settings on the cloud thus ensuring the date will stay safe, no matter what. The cloud platform is named Carbonite after the substance in which Han Solo is put to freeze in one of the Star Wars movies. The name suits it well, because Carbonite keeps the date intact forever. All you have to do is to pay a fixed rate and get your own backup space.